Ruby Machra, holds the prestigious title of Mrs. Universe North West Asia 2019. The other diamonds on her crown are : Winner of Mrs India Universe 2018, Mrs.Mumbai and Mrs. Glamorous. Strong willed & determined Ruby is born and brought up in Pune. She currently resides in the city of dreams, Mumbai. A fashion model, a professional spiritual healer and a proud mother of 2 teenage boys. She defines herself as a self made, dedicated and gregarious individual always striving to learn, evolve and get better. She aims to spread smiles and happiness in the intricacies of life and then spreading that mirth! She believes that you should experience life, the way you want to and strive to make ur present ur eternity. 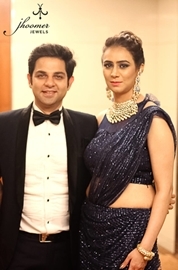 Ruby walked the ramp as a showstopper for Designer Amrita and Bharati Chhabria’s label Nine Figures adorning exquisite jewellery by Jhoomer Jewels at Rangoli 4.0 2019, an event by Unimo Universe of Moms on 29th March held at Holiday Inn Mumbai. Unimo is the largest online mommy community on Facebook and Ruby has been with Unimo since it’s inception in 2014 and is the Vice President today. Ruby looked absolutely stunning in the event wearing Designer C Singh’s collection. In her experience, it is not all about beauty. If you are good, have a strong personality and carry it well and can also put forward your ideas in the best manner, you do have an edge. According to her, having an identity of your own is very imperative & she has worked towards it & aims to still go higher and touch the pinnacle of glory !